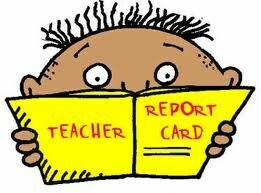 Report cards are issued every nine weeks. The following scale is used to determine grades. Students must earn (4) quality points in each subject area. Only letter grades appear on official school reports. *Students with incomplete course work in a subject will receive a grade of I (Incomplete). Students are given one nine-week period to complete or make-up any required assignments or tests. If not completed by the end of this time, the I (Incomplete) ﻿will automatically be changed to an ﻿F﻿.